Why did we develop PrintFab? Of course you can often achieve good results with manufacturer-supplied printer drivers. However, if you print the same photo on different printers, you will discover that these prints are not identical but show quite different colors! One reason for this is that each driver tries to "beautify" printouts by increasing contrast and color saturation etc. Advanced users might not be satisfied with with color balance, color gradients and the reproduction of fine nuances. PrintFab addresses advanced users and is designed to produce well-balanced printouts with natural colors. Of course you can still individually adjust brightness, contrast, luminosity of colors etc. Beyond the limits of an ordinary printer driver, PrintFab can print on any paper or printable medium with highest color accuracy – and also makes it possible to use special inks from third-party manufacturers. This is made possible for everyone by our budget-priced printer profiling service (EUR 14,95) - of course you can also use profiles created with your own color measurement equipment. Unlike the manufacturer-supplied drivers, PrintFab is designed for advanced users, professional and amateur photographers, fine art printers and pre-press. PrintFab's intelligent ink saving functions also offer advantages for home use and production printing. The integrated color management makes sure that printouts are not just rendered colorful and over-sharpened but the document's colors will be reproduced accurately. Thus you will get almost identical colors of the same document printed on different printers or paper (within the technical limitations of each printer and paper). PrintFab comes with integrated color profiles for a range of commonly used printer papers. With our color profiling service you can achieve best results with any type of paper or even third party ink! PrintFab's color management meets the highest demands – with appropriate printers PrintFab can produce proof prints with exact colors that are suitable as a reference for offset printing. Check the print layout and verify or change print settings before sending a job to the printer. With PrintFab Home L and higher, you can even preview printed colors on-screen (softproof). You can scale, crop and move page contents, delete or add pages of your print job. Further you can also cut out snippets and combine them on a new page – this can be convenient when printing web pages where you may want to remove ads or navigation buttons. The edition PrintFab Pro can print like a RIP software (Raster Image Processor): With the CMYK mode and a suitable ICC profile for offset printing (e.g. "Fogra ISO Coated"), PDF documents intended for a print house or online print shop can be "proof printed" which means that colors of the printing process are simulated. PrintFab is also available for Windows, Mac OS X and Linux (TurboPrint), thus you can print comfortably with consistent results even in a mixed network. 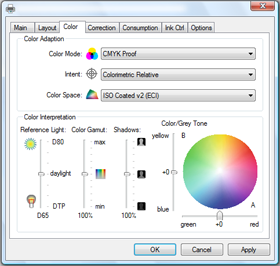 Printer color profiles have to be created only once and can be used on all platforms.